How to Retrieve Items that Fall Down the Sink Drain | Weilhammer Plumbing Co. Inc.
← Get Free Plumbing Advice From a Master Plumber When You Call Weilhammer Plumbing Company! When you drop something valuable into a sink, you instinctively let out a huge gasp of fear while simultaneously rushing to grab it before it falls down the drain. This is a common reaction for most people because no one wants to lose something of value, especially if that “something of value” is a diamond earring, gold cuff link, or worse, wedding ring! And unfortunately, plumbers get a lot of calls about lost jewelry items like these. But even when you drop something down the drain that is not necessarily “valuable”, it is only natural to want it back. So if you are someone with clumsy hands, a small bathroom counter, or a lost item down a sink drain, then this blog is for you! Continue reading to learn an easy method to retrieving lost items that have fallen into drain pipe abyss. We only lead with this because there is no shame in calling a plumber for help with retrieving lost items in your sink drain. Even if you could do the task on your own, sometimes it is more efficient to let a professional manage the problem for you. They retain the proper tools and knowledge, and of course hands-on experience, which allows them to get the job done quickly and safely. This way, you won’t have to worry about accidentally damaging or jeopardizing your home’s plumbing system in any way, and you can avoid the trouble you would experience in the case that you run into larger plumbing problems as you open up your drains and dive into the process. But if you are confident that you are equipped and capable of doing it on your own, you should still consider contacting a local licensed Indianapolis plumber for free plumbing drain advice. 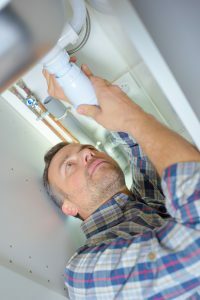 Trusted and honest plumbers will happily provide free advice upon request. Locate the water valve under the sink and turn it clockwise to shut off the water supply. You may need to use your wrench to turn it. If you cannot turn it manually, try your main water shut-off valve for the whole home. Clear out all the items from under your sink. Place your old towel under the sink pipes to control any leakage or mess. Locate the pipe catch. Also called the “P trap”, “J bend”, “J pipe”, or U valve”, this pipe piece is curved and has two slip nuts at each end. Since this part of the sink piping is bent, most lost items are found there. Note: In the picture above, you can clearly identify both the slip nuts and the pipe catch. The wrench is on the vertical slip nut, and the hand is on the pipe catch. Remove the pipe catch. To do so, loosen the slip nuts by turning them counter-clockwise, either with your hands or your wrench. When opening plumbing valves, it is helpful to remember the popular phrase, “Lefty-Loosey, Righty-Tighty”, which means counter-clockwise opens and clockwise closes. Once you have the pipe catch off, you can inspect the contents inside to look for your lost item. Depending on how clean your pipes are, there could be a lot of gunk and bacteria inside. So be sure to wear your rubber gloves for safety, and use your flashlight for a better view. If you found your item, then congratulations! If you did not find it, then you at least put in the effort to find out whether or not your item was still there. And for that, great job! Now move on to the last step. Reattach the pipe catch by holding it in place and turning the slip nuts clockwise. You may need a partner to assist you with this step. This can be anyone capable of holding the pipe catch in place, so feel free to appoint your inquisitive 3 year old for help! What a great learning experience! Be sure to catch next week’s blog for a guide to retrieving lost items in the shower drain! Call Weilhammer Plumbing Co. Inc. at 317-784-1870 for free plumbing advice from a state-licensed master plumber in Indianapolis, Indiana. Owner and master plumber, Mark Weilhammer, is happy to answer your questions about plumbing problems. With more than 50 years of experience, you can trust him for accurate and honest plumbing advice. 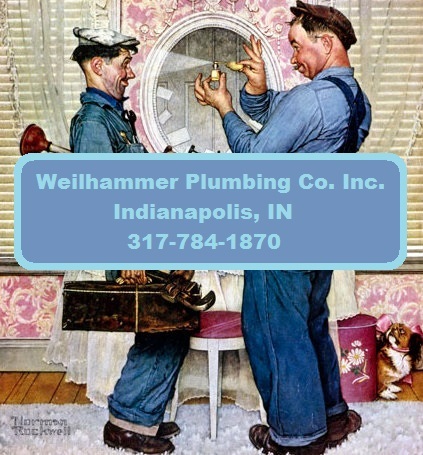 Our family-owned and operated plumbing company has served Hoosiers with residential and commercial plumbing repair for more than 100 years! So you can feel confident that we are the right choice for plumbing service and repair in Indianapolis and its surrounding counties. Call 317-784-1870 to speak with a friendly plumber, today. This entry was posted in Plumbing Pipes and tagged dropped ring down drain, dropped something down drain, dropped something in drain, get jewelry out of drain, get jewelry out of sink, Indianapolis plumbing company, master plumber Indianapolis, plumbing advice, plumbing repair Indianapolis, plumbing service Indianapolis. Bookmark the permalink.